Use an electric drill equipped with a bit that is designed for metal applications to drill a hole in a steel drum. The durable bits are constructed of hard materials such as tungsten carbides or high-speed and cobalt steel. 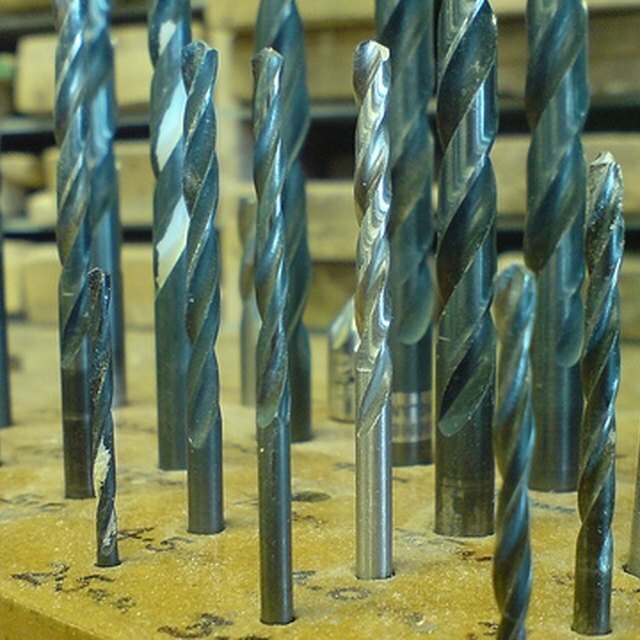 These materials feature high friction- and heat-resistance, giving the metal-boring bits longer life spans. When drilling a hole into a steel drum, use an electric drill that is capable of both high and low speeds for easy bit control. Make a mark on the steel drum to indicate where the hole will be drilled. Use a fine-tipped marker or a crayon. Make a small dimple where you made the drilling mark. Create the dimple using a nail set tool with a hammer. Equip the electric drill with a bit that is designed to be used on metal materials. You may need to use a chuck key to loosen and tighten the drill chuck around the bit shank. Hold the drill at a 90-degree angle with the drill bit resting at the dimple. Holding the drill at this angle will allow the bit teeth to penetrate the steel drum. Angling the drill will allow the bit to easily walk along the drum surface. Slowly press the drill's trigger, allowing the bit to penetrate the steel drum. Once the tip has started to penetrate the material, you can speed the drill up. Firmly press on the back of the drill to allow the moving bit to dig into the steel, which will create the hole.